A few weeks ago I mentioned I had gone to my local photography club and showed a few of my recent photographs. The club members were less than impressed. I included one photograph - a stink bug that had landed on our car while Ken and I were parked in Valley Forge Park. 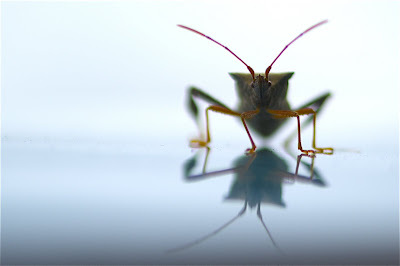 Well, after I posted that story, a few of you wrote saying you truly liked the stink bug. Sylvia, my artist friend from Japan said she was going to use him as a prototype for a children's story she is writing and illustrating. And Maryann said not to let the club members get me down. She suggested I enter the Stink Bug into a contest. WELL.... it just so happens that my on-line photography school - BetterPhoto.com has a masterpiece contest each month. This month the theme is reflections and shadows. I entered my stink bug about two weeks ago. This morning I checked the results and lo and behold, Mr. Stinky is in FIRST PLACE! Now, of course, all this could go down hill quickly as the contest is not over until the end of October. In the meantime, I am riding high and have a new appreciation for all bugs and all dear friends who love bugs. You are teaching us all an appreciation for bugs. Cats were easy, but bugs - now there's a true sign of an artist. Thank you Kathy. Bugs are wonderful creatures. Truly. Legs and antennae and shadow and depth. What's not to like. I think ole' man stinky is a winner. Keep snapping away Aunt Kitty. Hugs, Charley. See? I knew that stink bug was going to go places! Congrats. I hope it keeps up. There are people out there who recognize greatness. Enjoying your blog! So, what is the final verdict in the photo contest in the BetterPhoto.com? I hazard to guess you won the top prize. Whatever happened, the photo has won my heart. And its image got indelibly etched in my brain. Stinky is still in first place by a hair. Won't know until midnight tonight if he wins. I'll update tomorrow.